These wonderful French macaroons can be found at French pastry shops in Paris and San Francisco. They are fun to make and delicious to eat! 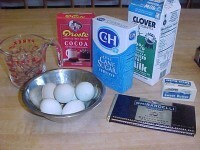 To make the chocolate filling, put the milk and butter in a saucepan and bring to just below the boil. 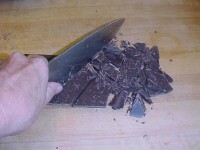 Remove from heat and stir in the chocolate. When thoroughly mixed, pour into a bowl. Let cool, cover with plastic wrap and chill overnight. To make the macaroons, preheat the oven to 400 degrees and line 4 baking sheets with parchment. 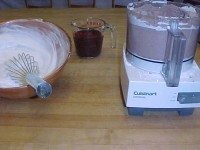 Mix the sugar and almonds in the food processor until the almonds are finely ground. Add the cocoa and mix again. In a clean copper or glass bowl, beat the egg whites until they are smooth and hold a stiff peak. 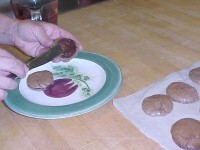 With a rubber spatula, fold in the cocoa mixture in four batches to make a thick batter. Spoon tablespoons of the batter on the prepared pans about a inch apart. Bake for about 11 minutes in the preheated oven. To cool, transfer paper off the baking sheets onto the counter. To assemble, spread a tablespoon of the chocolate ganache on the bottom of a macaroon, cover this with the bottom of another macaroon. Chill for at least 1 hour. 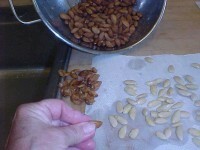 Note: To remove skins from almonds, simply drop them into boiling water, turn off the heat, and let sit for 5 minutes. The skins should slip off easily. This is called blanching.